Samsung fits all your cables into a single optical cable connect to its One Connect Box, removing the need for cable management and giving your TV a much cleaner and neater outlook. To get your hands on one of the QLED TVs, you will have to pay through the nose – the cheapest QLED TV… food for thought. Riding on a High Just when you thought Samsung couldn’t get any more popular after the high demand of its Galaxy S8 and S8+ smartphones, it goes ahead and introduces its QLED TVs in spectacular fashion. Being the first in the industry to feature quantum dot (QD) technology into TVs, Samsung is paving the way for constantly innovating our lives with its devices, whether it’s a smartphone or even a TV. Coated in a full on metallic body, the Q8C features a 65-inch QLED 4K ultra HD display paired with a border-less design. Watching movies on it is a definite must as you will now have nothing in the way of the screen so you can enjoy it like how the director intended for it to be. Not to mention – it’s sleek, metallic design can blend into any modern household with ease, giving an added touch of class and elegance. QD technology essentially encompasses very small semiconductor particles that are only nanometres in size and is capable of emitting light of specific frequencies if electricity or light is applied to them. Samsung fits its QLED TVs with plenty of features that is sure to rival even the best of OLED TVs. Aside from its QD technology, the brightness of the TV reaches up to 2,000nits, which is a lot for a TV. The Q8C also comes with HDR technology, which further increases brightness of colors while still maintaining the deepest blacks on a much wider range as compared to what is provided with a conventional TV. Many Ways to Mount Whether mounted on a wall, with a Gravity Stand or the easel-like Studio Stand, the Samsung Q8C 65-inch TV can be displayed in a variety of ways to suit your household. 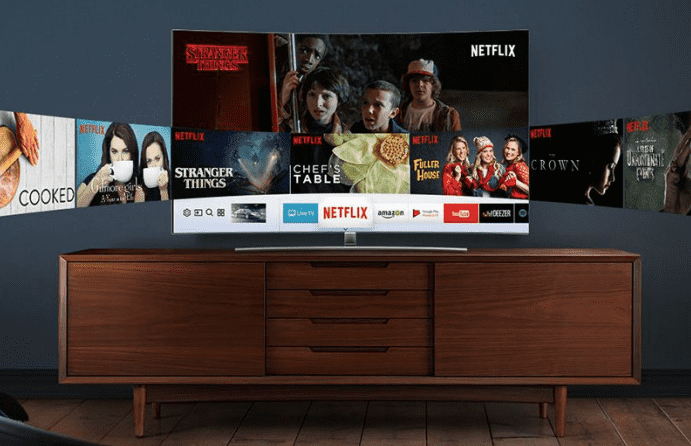 Free Streaming Lasting until 30th June, every purchase of the Samsung QLED TV grants you a free 12-month subscription to Asia’s top VOD service – iflix. Whether it’s the TV, its One Connect Box or even your Bluray player, every Samsung QLED TV comes with the One Remote Control, removing the need for multiple remotes. Giving Colors New Life Thanks to HDR, it also provides great color contrast to the Q8C, allowing you to spot even the darkest of objects in a black background setting. The Q8C also comes with a wide viewing angle without compromising on its color consistency. While most TVs lose out on color and contrast when viewed from a side angle, the Q8C provides the same consistency, no matter where you’re watching it from.